Mattel has been announcing brand new WWE action figure lineups for 2019 week after week lately. The toy company has also been releasing a ton of figures before the year comes to an end. New basic, Elite, and Battle Packs figures have all be coming out in time for the holiday season, and even Ronda Rousey's first WWE figure is available to purchase right now. However, even more figures are on the way over the next few weeks. Two new figures that have just been released are certainly unique and will definitely be sought after by collectors and fans alike. These are new figures that are already available to purchase online. Without further ado, let's take a look at these brand new Elite action figures from Mattel. Kurt Angle - Angle's return to WWE last year allowed for Mattel to produce several figures based on the Hall of Famer career of the Olympic gold medalist. Numerous Angle figures have already been released, but this one is a very special figure that likely won't be rereleased in a different lineup any time soon. This version of the former world champion is based off of the one night when he teamed up with The Shield. Angle teamed up with Dean Ambrose and Seth Rollins at TLC last year to defeat the team of Braun Strowman, Kane, The Miz, and The Bar. The unique visual of Angle wearing The Shield's ring gear almost guaranteed that this figure would be made someday. Sure enough, a Shield Kurt Angle figure has arrived. Angle's figure still has that enormous smile that the former world champion had on his way to the ring. 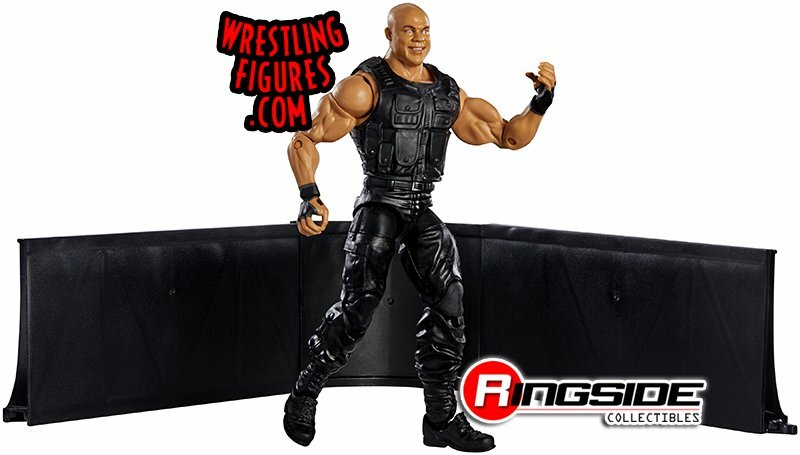 Of course, he comes with the black Shield attire, but the figure also includes a breakable ringside barricade. 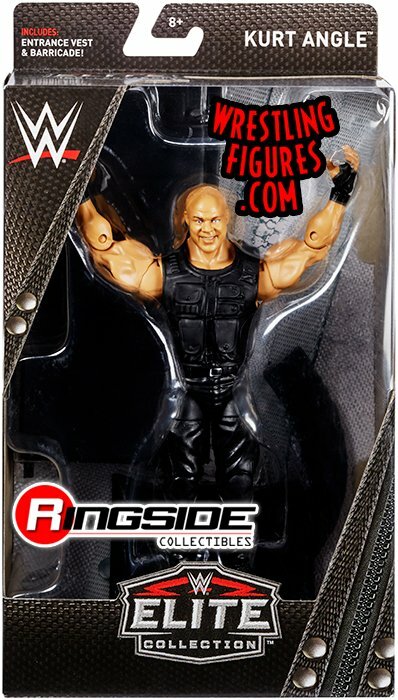 Angle is only available at Ringside Collectibles, so click here for more information. 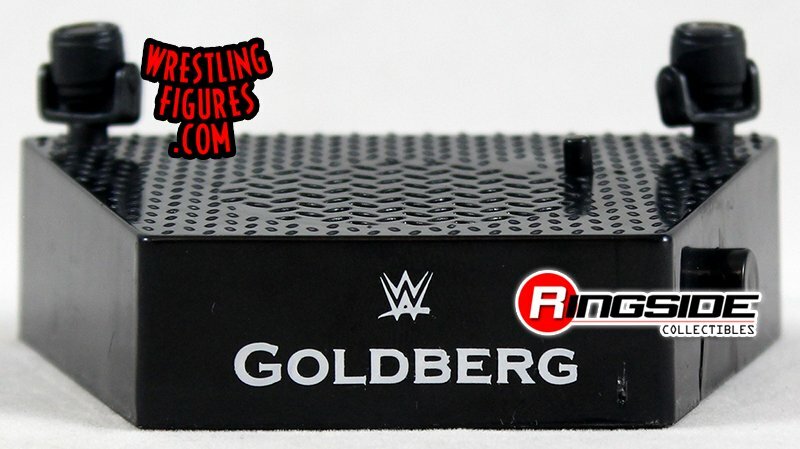 Goldberg - This figure is part of Mattel's Entrance Greats series, which means that it includes a display stand that can play the first thirty seconds of Goldberg's entrance music. Goldberg also sees him come with the WCW World Heavyweight Championship, black ring trunks, a sneering headscan, and he also sports his iconic shoulder tattoo as well. Mattel rarely ever makes figures for this recent WWE Hall of Fame inductee, so collectors definitely may not want to pass up on this one. Goldberg's Entrance Great figure can be ordered here.